Recently, in Minneapolis, longtime New York Knick player Trent Tucker (he played for them for 10 years), had a charity event to benefit the “Trent Tucker Youth Program.” Normally, this event is all about the golf, and people pay a minimum of $5,000 per person to play with the likes of Michael Jordan, Kevin Garnett, Patrick Ewing, Byron Scott, Charles Oakley, Scottie Pippen and many other NBA stars and celebrities. The 2006 version included a no-limit Hold ’em charity poker tournament at Canterbury Card Casino; and Johnny Chan, Michael “the Grinder” Mizrachi, Greg Raymer, Phil Gordon, Liz Liu, John Phan, Patrick Antonious, Marcel Luske and myself were there to support the charity. Since my brother David and my agent Brian Balsbaugh were both long time residents of the twin cities, I was pleased to have had an inside report that said that Trent Tucker is first class in every sense of the word. 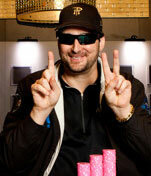 About 120 players entered the poker tournament, including the No. 1 celebrity in the world, Michael Jordan, but not including Ewing or Scott (Scott told me that he doesn’t play, but that his 19-year-old daughter loves Hold ’em). I busted out when I limped in with Q-10, two others limped in behind me, and the flop came down Qc-10c-9d. I bet the flop and was called by one player, and then Phan moved me all-in. I “insta-called” his bet and Phan rolled over the 8c-2c. He needed a club for a flush or a jack for a straight. The first card off was the Jc, and the next card off just plain added insult to injury; it was the 9c and made Phan a straight flush! Phan came all the way to Minneapolis to bust me, but I still bought Dom and Cristal for him at the club (“Karma”) later that night. As I talked a little trash with Jordan about his Hold ’em game, I noticed that he was the chip leader for most of the night. In one hand I saw him call the $4,000 big blind bet (he limped in) in late position with A-A. Limping in with pocket aces is a pretty sophisticated play, and it worked like a charm when the flop came down 8-6-2, and Jordan busted the player in the small blind (who was holding Q-8). Later, I saw Jordan limp in with A-J, whereupon the small blind moved all-in with A-10, and the big blind called all-in with his short stack of chips with 10-3. Jordan called, and he was a huge favorite to win an enormous pot one more time! The flop was J-4-4, Jordan busted two players in this hand, and he was now at the final table with the chip lead. Phil Gordon announced the final table action while the spectators gathered around seven deep to watch Jordan attempt to win one more championship. Chan, Oakley, Ewing, Raymer and I were standing behind Jordan as he dusted off players. One key hand Jordan had 5-5, with a flop of 7s-7d-2s, and he bet out. The only player at the table that had him covered moved all-in, and Jordan — who had been playing with that particular player all night — studied for almost 80 seconds before he called. It was a great call, and Jordan now took a huge chip lead with three players remaining. When Jordan made it down to the final two players, he was all-in with A-7 vs. his opponents Q-9. He needed the A-7 to stand up (he was about a 57 percent favorite), and if it did, then he would have a huge chip lead. The flop came down 8-7-6, and now the player with the Q-9 needed a five, a nine, a ten, or a queen. It was a dangerous flop for Jordan, but the next card was a seven, and now he only had to hold off a five or a 10 on the last card. The last card was a jack, and Jordan went on to win the title, the trophy, and the $25,000 first place prize, which he promptly donated right back to the Trent Tucker Charity, along with the $50,000 he paid for the custom made “chopper” motorcycle (signed by all of the celebrities) he bought for his friend Mr. Oakley. Jordan was definitely on cloud nine when he won, and who wouldn’t have been? He told me that that is his first Hold ’em tournament win, but he is a man that collects titles, so watch out poker world!